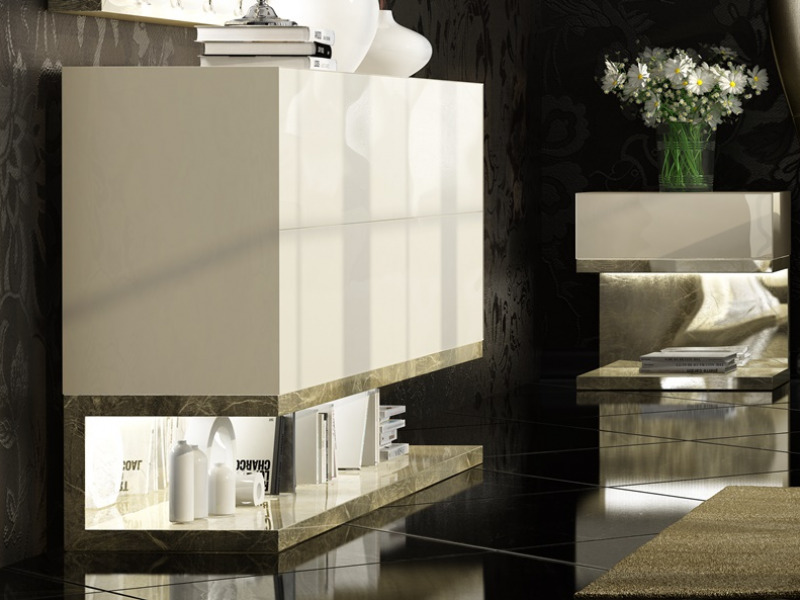 Spectacular upholstered and lacquered bedroom. 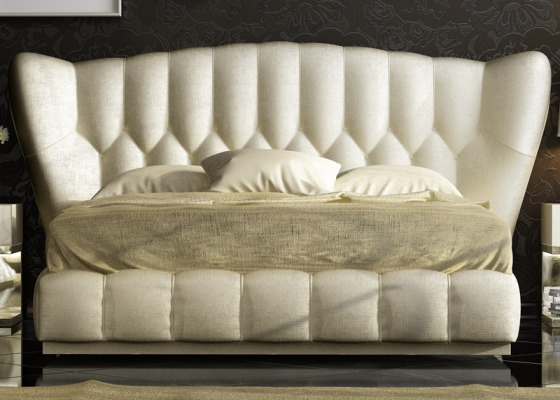 Complete bed (upholstered headboard and bed frame) with curved lines. Top quality upholstered frame bed with faux leather. Possibility of bed storage, check the supplement of price in our section "OPTIONS BED FRAME". ** THE INDICATED PRICE IS FOR THE COMPLETE BED (HEADBOARD AND A BED FRAME IN ANY FABRIC OR FAUX LEATHER FORM OUR ATTACHED PDF. 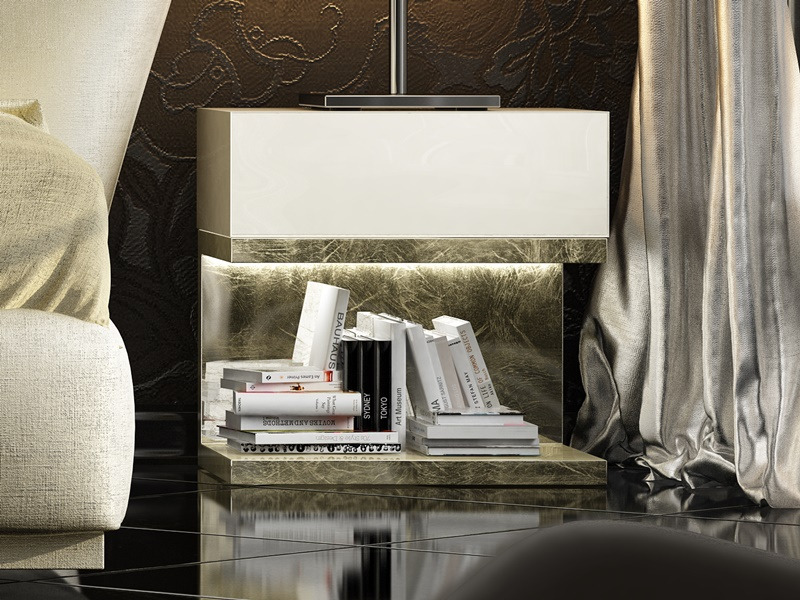 Check our PDF of fabrics and faux leathers where you can choose from a wide range. FINISHES PICTURE: FAUX LEATHER VICTORIA WHITE. Possibility of headboard without frame of bed. 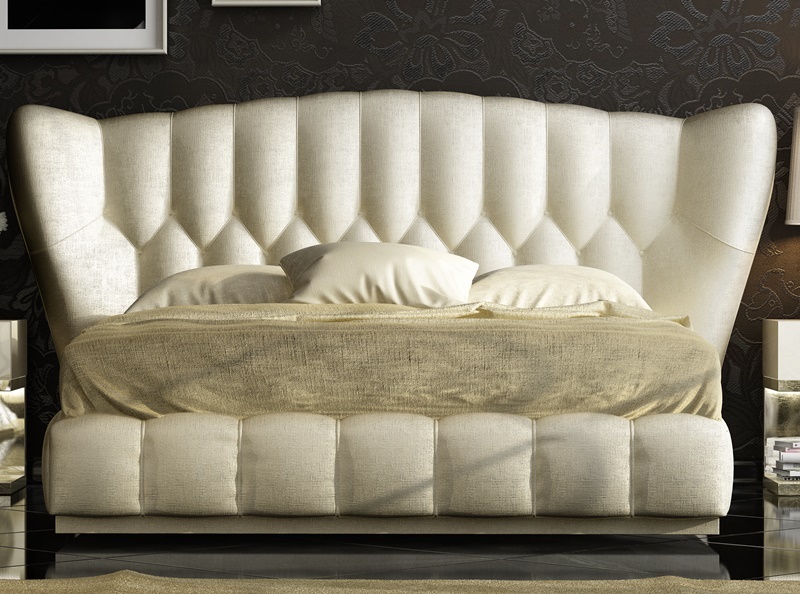 Elegant upholstered padded headboard with buttons. Upholstered in a traditional way by master upholsterers. Structure in solid beedch and pine wood. Check out our PDF for fabrics and faux leather all combineable between them. POSSIBILITY OF SWAROVSKI CRYSTAL BUTTONS. CONSULT THE PRICE SUPPLEMENT IN THE "COMPLEMENTS" SECTION. Original bedside tables with one drawer. THE MODULES MUST BE FIXED TO THE WALL. ALL THE MODULES HAVE A LED LIGTHING SYSTEM. PUSH opening system for drawers. Made of MDF FIBRALAC fiber wood specially developed to achieve the best finish possible when carrying out the lacquering process and dyed open pore oak wood. Check our PDF of lacquered finishes all combinable between them. 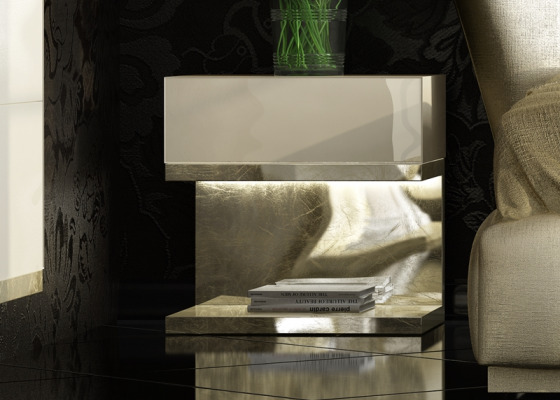 *** THE INDICATED PRICE IS FOR TO THE BEDSIDE TABLE IN ANY LACQUERED IN HIGH GLOSS OR AOK WOOD AND BASE IN HIGH GLOSS GOLD, SILVER OR CHAMPAGNE LEAF FROM OUR PDF***. Original chest of 4 drawers. BED FOR 160 CM MATTRESS: 210x24x150 h. cm. BED BASE FOR 160 CM MATTRESS: 173x210 (FOR 200 CM MATTRESS)x35 h. cm. BED FOR 135 CM MATTRESS: 187x24x150 h. cm. BED BASE FOR 135 CM MATTRESS: 148x210 (FOR 200 CM MATTRESS)x35 h. cm. BED FOR 150 CM MATTRESS: 202x24x150 h. cm. BED BASE FOR 150 CM MATTRESS: 163x210 (FOR 200 CM MATTRESS)x35 h. cm. BED FOR 200 CM MATTRESS: 253x24x150 h. cm. BED FRAME SIZES: 213x213 (FOR 200 CM MATTRESS)x 35 h. cm. BED FOR 180 CM MATTRESS: 233x24x148 h. cm. BED BASE FOR 180 CM MATTRESS: 193x210 (FOR 200 CM MATTRESS)x35 h. cm. BED FOR 193 CM MATTRESS: 243x24x148 h. cm. BED BASE FOR 193 CM MATTRESS: 213x210 (FOR 200 CM MATTRESS)x35 h. cm. 60x40x60 h. cm. 70 x 40 x 60 h. cm.